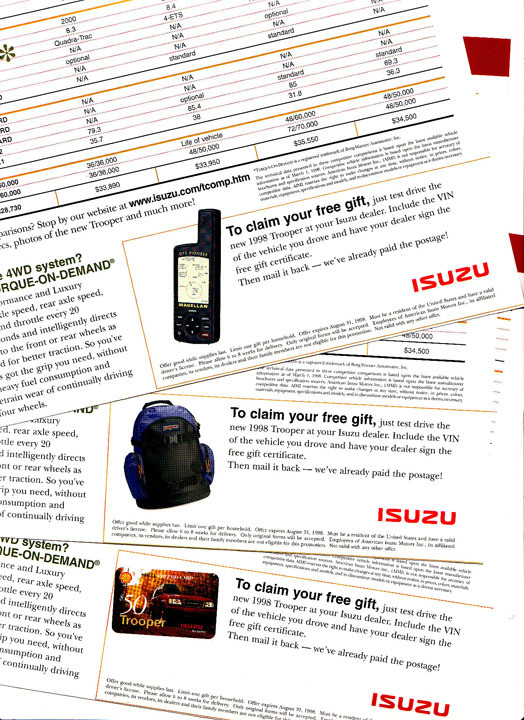 When Isuzu tested three offers, they learned that it’s possible to offer TOO much for a test drive. they offered a backpack, a $50 value gasoline card, and a GPS! The GPS they offered brought in a lot of bad leads for test drive, just to get the gift. Yes, it’s true, if you offer enough incentive, people will even spend time with an Isuzu salesman! Regardless of the channels in which you sell, testing is invaluable to your business. And offer testing, in particular is misunderstood in both practice and power. Yet testing seems complicated and time consuming! Is it worth it? The answer is: you can’t afford NOT to test. Here’s why: each program you’re running has many elements that could be doing their job well … or they could be failing! The ONLY way you will ever know what works best to help you win customers, is to test as many of these elements as you can, in a disciplined environment. The offer is something you “dangle” in front of your prospect or customer in order to change their behavior. If you want your average order size to be higher, make them an offer that slightly raises the bar for how much they’d normally spend. So in prospecting, if your average first order comes in at $55, then you might develop an offer for new customers to get that first order $10 or $20 higher. The fact is, if a prospect has too much time to think about it, they’ll put it aside and forget about it, even if they were motivated to act at the time they saw the promotion. You want to make sure they really act, when the offer is top of mind. So often I hear people say, “We don’t have an offer because we don’t want to discount.” The irony is this: a discount is usually the last thing I’d suggest as a really great offer… although it still must be tested. The offers I’ve seen to work best have been relevant and interesting or different ‘gifts’, ranging from online-fulfilled gift cards for sister companies, to signed, framed limited edition photographs. A winning offer has something that reminds people of you when they use or enjoy the offer. It also has good perceived value, but not so high that someone will order, and then return, just to get the offer. B2B should have offers just as consumer products and services do – but their offers may be different in scope or purpose. White papers are common but only effective if they are current and a truly intriguing topic. So a white paper that just tells them about your company is not a good offer. Sweeps and drawings can be a good offer for some efforts; getting people to sign up for email, for example. But a sweeps will typically win in the “front end”, but lose in the “back end”. This is not always the case though; if your list is really exemplary, then your leads may all be strong despite the lure of the sweeps. This is why we test! Another side of B2B offers is concern regarding value. Often, companies won’t let employees accept something more valuable than, say, $10. When New Pig developed offers that included kooky toys and t-shirts, they fit the bill for value — plus, they’re collectible and fun. Even in B2B, human behavior plays a huge role. We developed a pizza giveaway for HP, generating high quality relationships and sales. Pizza was universal and fun in appeal – and it got attention because of how unusual an offer it was. I’ve seen one offer double or even quadruple response from another in an A-B test. I’ve seen other offers flat line! But the bottom line is, if you believe that offers don’t work for you, then you just haven’t tested enough. Be sure to measure test results carefully in both the front, and the back end. Tenacity is a key to successful testing. Learn and grow with strong testing programs. You may become addicted to the excitement of more rewarding efforts and stronger sales!